In previous posts we looked at some of the details in Shenmue that reflected life in 1980s Japan, such as the washing machines sitting outside the apartments and the heating arrangements during winter. Today we check out some more typical items from Japan during the '80s, that Ryo encounters as he wanders through the suburbs near his home... starting with telephones. There are a few different styles of phones that Ryo can interact with in Shenmue, all of which would have been commonly seen in Japan during the time in which Shenmue was set. The first telephone the player encounters is the domestic-use one at Ryo's home. In addition there are a couple of different types of public phone in Ryo's neighborhood. Public phones in Japan generally have an easily-distinguishable color, which helps identify the features a phone offers (as technology advanced models were released that offered international calling, push-button "dialing", accepted phone cards as well as coins and so on). Of course, with the ubiquity of mobile phones, public phones are harder to find in Japan these days. Let's see how their in-game appearance stacks up compared to images of the real thing. 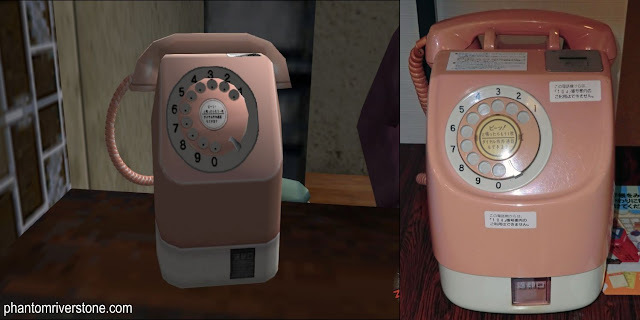 The phone in the entrance hall of Ryo's house is a black rotary-dial phone that was supplied by the formerly government-owned Japanese telecommunications company NTT. It used to be found in almost every Japanese home. Although other colors were also manufactured, the classic black was the most popular and is known by the simple nickname of kuro denwa ("black telephone"). This particular model was also very hefty, having a solid receiver and a heavy metal base which brought the total weight to around 2.5kg - later models reduced this. Left: Ryo's home phone: "Should I call Nozomi?" Right: Yes, it was common for people to rest the phone on a lace mat! The pink phone was designed for placing inside shops and restaurants. It accepts 10 yen coins only. 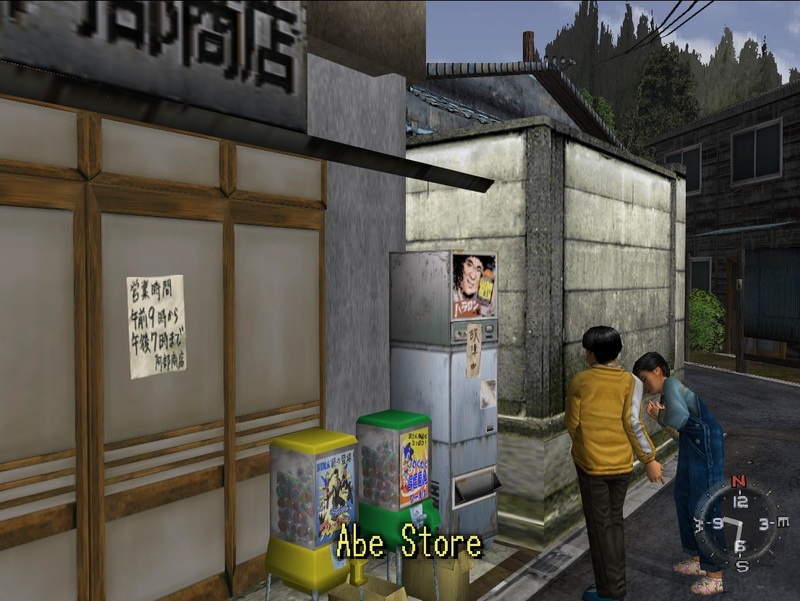 One example in the game is on the counter at the Hirata Tobacco Shop in Dobuita. Left: Pink telephone at Hirata-san's tobacco shop. Right: the real one is even bulkier in real life. First manufactured in 1972, this model of public phone was bright yellow in color and came with either a 10-yen or 100-yen slot. The phone in the public phone box in Sakuragaoka is the 10-yen rotary type. (Probably just as well for Ryo, as the types that accepted 100-yen coins did not give change). 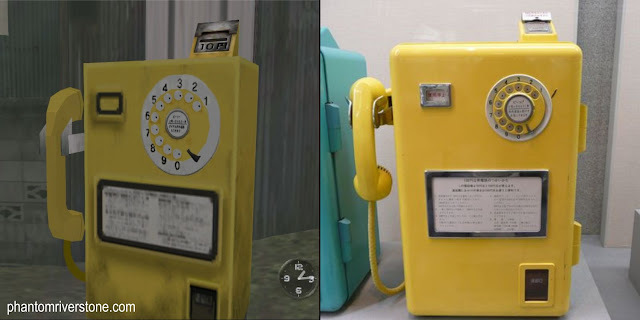 Left: Yellow phone in the phone box in Sakuragaoka. Right: The dial is somewhat smaller on the actual phone - no need for Ryo's stubby fingers to fit. Many of the houses in Shenmue have wooden boxes outside for holding the milk bottles, marked with the logo of a fictitious company, "Majin Milk". Home delivery of dairy products, such as milk and yogurt, is a service that surprisingly is still available even these days thanks to the marketing efforts of the milk companies to combat lack of consumer interest which had been dwindling throughout the 1980s. This dated but interesting article from the Japan Times in 2003 reports that one of the large dairy companies at that time, Meiji Dairies, had succeeded in reversing the trend and managed to double deliveries made over the prior ten-year period. 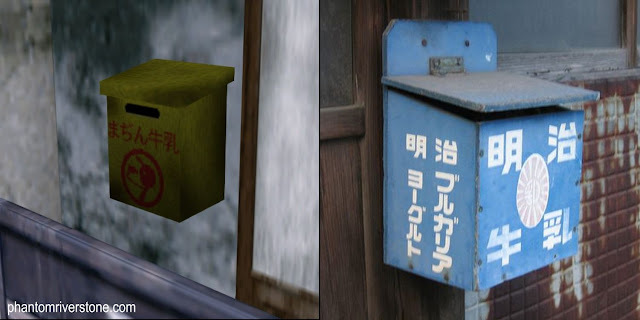 There are many such milk boxes to be seen around Ryo's home town once you keep an eye out for them (although I've never seen anything that looks like a delivery van in the streets). Left: Box for milk deliveries at a house entrance in Dobuita. Right: an old-style wooden milk box. These days they are insulated and made of plastic. Have you ever wondered about the vending machine that stands outside the Abe Store, next to the capsule toy machines? Unfortunately it's in a sorry state, with an "Out of Order" notice stuck to it. But at least the guy in the photo at the top of the machine looks to be in good spirits. The machine appears to be a popular spot for kids to hang out. Wait a second, that face looks familiar... Let's take a closer look. It's always "Out of Order". Yes, he's turned up again here! It's actor Hiroshi Fujioka, otherwise known as Segata Sanshiro from the old Sega commercials (and as seen in this fan-made comic from an earlier post). The advertisement on this vending machine is an amusing parody of one of the commercials he featured in around 1985. The product being advertised is "Real Gold", a Japanese energy drink marketed by Coca Cola which remarkably can still be bought even these days at places like convenience stores. Just as with the other items replicated in the game, his likeness has been captured remarkably well, don't you think? 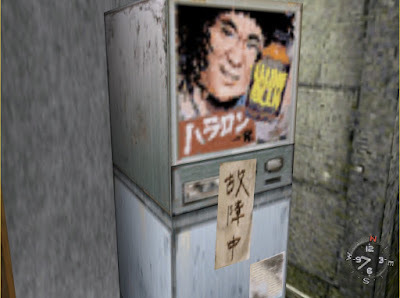 Left: Segata Sanshiro advertising "Hararon"...? Right: Hiroshi Fujioka with the genuine article, the "Real Gold" energy drink. A very fun and wonderful article to read! Thanks so much for putting this together. Always a pleasure to share more Shenmue awesomeness. Wow, that is some cool insight! 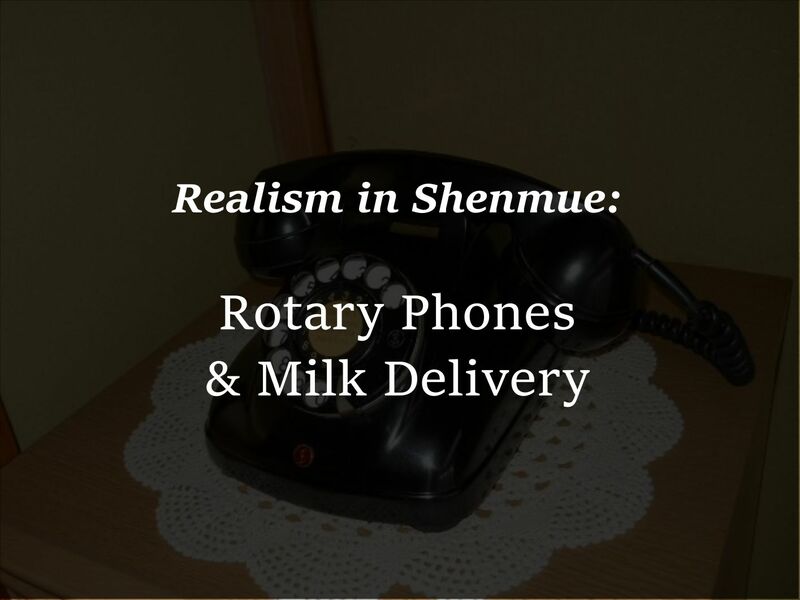 In my opinion the greatest strength of Shenmue is how well it depicts reality. Well, it makes reality exciting. These articles are fascinating... I'd just assumed that the milk boxes were actually post boxes. I love these type of articles Switch, I hope they keep coming! Hi DreamcastPast! You'll be happy to know there's still a heap of topics still to come. (The hard part is deciding which to write about next! ).